Lightning on Jupiter is no surprise. What is significant is its distribution. It occurs only in the polar regions but more widely distributed in the northern one. As discussed in two previous posts, the atmosphere north and south of the Great Red Spot is filled with particulate matter, dust, comprising the full range of known elements being released by the fusion reaction located at approximately 22 degrees South Latitude. These react with one another in the hot vortex which lags the rotation of Jupiter, leaving the atmosphere at the GRS. While traversing the hot vortex, they form compounds, and as the vortex expands these crystallize and enter the atmosphere producing the unidentifiable colors we see. Because of the heat, they form unusual high temperature compounds which have never been identified. One example is CS, carbon mono-sulfide, identified on Jupiter and Venus but rare on Earth, which produces tiny red crystals that produce the color of the Great Red Spot and the clouds. This is a continuous process, so these heavy dust particles are falling to the surface as fast as they are created. One post, Jupiter’s Jiu-Jitsu Belt, explains that the dust only covers the mid-latitudes and that poleward from the belt the atmosphere is clear, revealing Jupiter’s Polar Oceans. Therefore the lightning only occurs where the atmosphere is more Earth-like, even though the winds are strongest in the mid-latitudes. This may be due to the heavy-element dust composition which is continually falling to the surface. 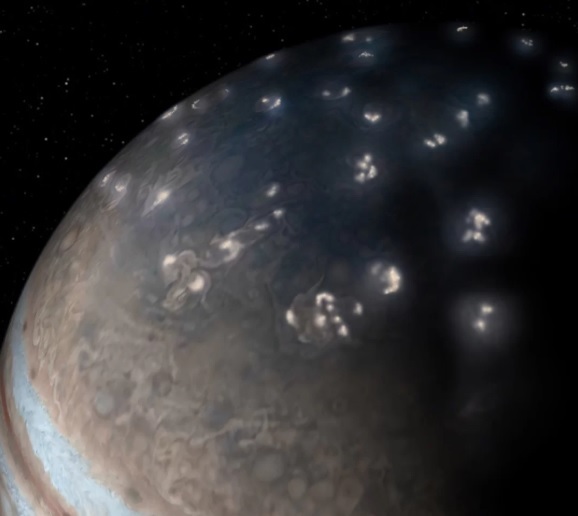 Also Jupiter’s polar cyclones may be the source of the lightning. The wider distribution of lightning in the north polar region is consistent with the center of the dust production being centered at 22 degrees South Latitude. ~ by Angiras on June 6, 2018.